Congestion flare-ups at Hartsfield-Jackson Atlanta International (ATL) that are delaying air cargo shipments underscores the broader US challenge serving up higher transportations costs to shippers, in addition to pressures from steeper fuel prices and higher trucking rates. ATL says it has brought delays under control, but complaints persist. The squeeze is the result of airport congestion caused by truck choked intra-airport roads, often long lines of truckers delayed in picking up and dropping off loads, poor dock-door management, scant or overcrowded air freight facilities, and understaffed ground handlers — all strained by a rising tide of domestic and international air cargo tonnage. North American air cargo volume was up 5.3 percent in the first six months of 2018 compared with the same period a year ago, according to the International Air Transport Association. The delays all add up to wait time surcharges and in some cases storage expenses tacked on to already steep transportation bills that can disrupt logistics budgets. Strange as it may sound, it’s not uncommon for ‘detention’ charges to exceed the value of the goods being hauled, truckers and forwarders confide. To ease the crunch, some of the busiest airports such as Seattle Tacoma, Los Angeles International, and John F. Kennedy International are channeling cash into new on-tarmac or airport-adjacent cargo warehouse facilities with more dock doors and easier access to them. At the world’s busiest passenger airport, which is also the 42nd busiest cargo airport, the city and the cargo community took some drastic actions a year ago. Long lines of trucks waiting for cargo warehouse doors at ATL caused such a firestorm of complaints that city officials created a marshaling lot for truckers to wait until a dock door becomes available. Termed the “truck pass lot” and said to be the first at any US airport, it has been successful in getting haulers off the intra-airport warehouse approach roads, ATL officials maintain. But while trucking companies, freight forwarders, customs brokers, and airline cargo officials generally agree progress has been made, they privately and publicly lament that pickup and delivery delays are still a problem. In some extreme cases, drivers can be marooned in the truck pass lot for six hours or longer. It’s not uncommon for export shipments to miss cutoff times and flights, while time-sensitive import cargoes can arrive at consignee receiving docks a day late, some transport providers report. In a series of interviews, JOC.com has found anger and blame isn’t heaped solely on the airport leadership. “Some of the ground handlers here work as hard as they can and some are only working to do as little as they can,” said a trucking company executive dispatching trucks in and out of the airport. Swissport, he claims, will try to hire people but by the time their clearances and approvals come through, they may wind up with a much smaller percentage of qualified hires. Roy Copening, general manager of Swissport’s Atlanta operation, doesn’t deny he has difficulties hiring handlers but said the roots of the congestion issue cannot be laid entirely at his front door. He said the new truck pass lot, which holds 50 to 60 trucks, is more organized, coordinated, and even semi-automated. To get in, a driver has to present credentials, paperwork spelling out what’s being picked up or dropped off; the lot operator, using a software program, automatically assigns the driver a dock door. “Some truckers don’t even wait,” Paige said. “They get their credentials. Sometimes, they may have to wait five to 10 minutes to an hour and sometimes longer.” One challenge he admits: the longer it takes ground handlers to unload one truck, the longer the trucker waits for a specific dock door. Paige confirms the job market for cargo ground handlers is “tight” — as it is for all airport employees — and that the airport is working with community organizations and “stakeholders” to find a solution. He said United Airlines and American Airlines warehouses are in the north cargo area, Delta and Lufthansa have their own cargo centers, and truckers serving all the other airline cargo warehouses have to line up at the truck pass lot first. Even with the new marshaling lot, the trucker said Atlanta’s popularity as a gateway for importers and exporters to Europe, the Midwest, and South America has been exploding in recent years, reflecting the growth of the regional economy. 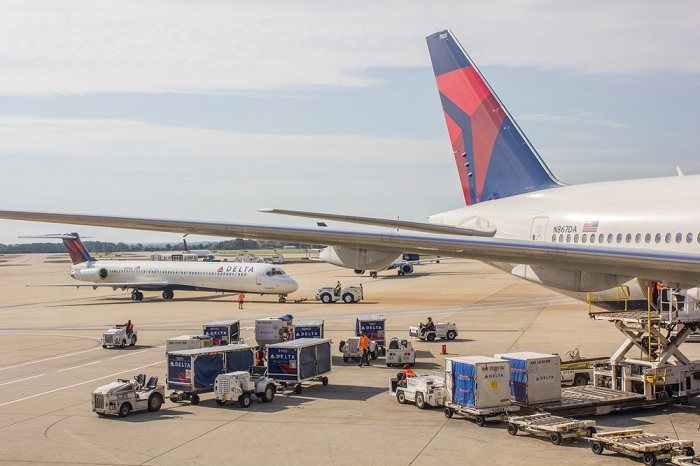 “There’s just so many more airlines, and Atlanta doesn’t have the motivated manpower and the facilities — there are not enough docks to accommodate the volume on a timely basis. So forwarders are having to add more detention money to their quotes or bills for wait times and delays that can still eat up two to four to five hours. Not much we can do about it,” he said. Worse yet, Solomon said, is if a trucker is dropping off an export shipment and picking up an import shipment and both airlines are in the south cargo area. After dropping off the export cargo, the driver is required to go back to the truck pass lot, get another dock door assignment, and wait for the import shipment. Sheckels said the real bite comes when the forwarder can’t recover the inbound shipment the same day because of the truck congestion and delays. “The airline charges the forwarder storage and that can be substantial. What I’ve actually done if I think there’s going to be a delay, I book delivery of the [inbound] cargo for the next day.” He concedes it costs his clients that extra day, but at least he doesn’t guarantee it and disappoint them. Indeed, Hartsfield-Jackson officials and other airport stakeholders — handlers, forwarders, truckers, and customs brokers — have been attending a monthly truck pass lot meeting for the last six months, but what is discussed is not published. Contact Chris Barnett at chris@cbarnmedia.com.